It’s episode 125! And it’s all about the hot button topics! 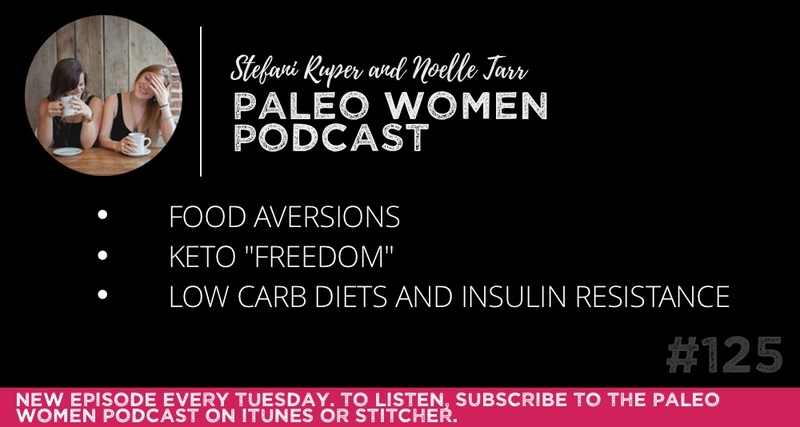 This week, Noelle and I discuss food aversions, ketosis and the concept of “keto freedom,” and how effective low carb diets are for insulin resistance. We have a brand new offer from Paleovalley to share with you that we are incredibly excited about. Paleovalley not only offers Grass-Fed Organ Complex, a gently freeze-dried organ supplement in pill form that contains beef liver, heart, brain and kidney, they also high quality snacks and collagen supplements on their website. Now, when you use the promotion code paleowomen at check out, you’ll get 30% OFF your entire order. You can try their grass-fed beef sticks, which are made from 100% grass-fed beef preserved through a natural fermentation process that gives probiotics to the sticks, or their superfood bar, which is made with grass-fed collagen. To take advantage of this special deal, simply go to http://www.paleovalley.com, and use the code paleowomen at check out. You asked how long it might take to get back to work. I hate to let you know that I needed 4 months before I could start working again. I probably could have done it in 3 if I really pushed, but my mental and emotional health would have suffered for sure. Also, I just didn’t want to miss anything. They change so much from day to day and I got to witness all of it. After 4 months, I started working part time from home and that was all I could handle. It wasn’t until I was 9 months postpartum that I actually started feeling normal again. (Just to put it in perspective and to show that could handle plenty of things up until this point in my life, I was a 50 hour/week Civil Engineer working in the construction industry. On top of that, I pursued my Health Coaching certification and started my business while I was pregnant. I prepared for the birth with Hypnobirthing.) Baby really knocked it out of me for a while. But really, 9 months isn’t terrible amount of time in the grand scheme of things, right?